In the final of this summer’s World Cup, France defeated Croatia 4-2. France was favored by many observers, Croatia was not. The ability of an unfancied team to reach a World Cup final is quite a story. It doesn’t happen very often and, while fans knew that Croatia had a terrific midfield, it was felt that their defense was questionable and their offense too dependent on one player. But the Croats rise to the last game in the tournament was not the biggest story of the Cup. This World Cup featured more upsets than any in my memory, and that dates back to 1966 when the Soccer Yoda first watched a World Cup match. Favorites dropped games and places in the tournament on a daily basis. Germany, Spain, Argentina, Portugal… they were all gone before the quarterfinals. Although the Soccer Yoda’s brackets were way off course, so were about 99% of the rest of the world’s predictions so I didn’t feel too bad. As discussions circled the world ( and my social media neighborhoods) there were several questions that drew the majority of the interactions. So here is the Soccer Yoda’s take on those BIG questions surrounding the 2018 edition of the planet’s biggest sports event. WHAT THE HECK HAPPENED TO GERMANY? The Germans were favored to win by many and anybody who thought they would finish last in their qualifying group ( was there anyone who actually predicted that?) was deemed crazy. But in their first match against Mexico, German manager Joachim Low was either cocky or just wasn’t paying attention. Defense wins soccer games and especially in tournaments. The Germans have been known for their ball skills and their machine-like offense, but meanwhile they have made a habit of shutting out opponents in important matches. They gave up only 3 total goals in winning the Cup in 2014. So when they came out with a system that put both outside backs up the touchline on offense, even when they were not assured of possession, it was a bit of a surprise and a huge gamble. Of course, teams have been using outside defenders as wide offensive players for years, but it is usually done into open space and when possession is not in question. In addition, many sides have methods to cover the area left vacant when the back moves up. The Germans seemed determined to run their backs right up the field no matter what, particularly right back Joshua Kimmich. The Mexicans could have tasked left wing Hirving Lozano with tracking back to stay goal-side of Kimmich, but Lozano maintained his offensive position and within seconds of start of the game Lozano was behind Kimmich and shooting at goal. Above, within the first minute of the game Lozano (#22, green underline) is goal-side of Kimmich (#18, white underline). This is a major defensive failing in soccer, offensive players with the ball cannot be allowed behind defenders. As the game went on Lozano continued to be a threat, but Low either didn’t care or didn’t notice and it is hard to imagine he didn’t see what was happening. But no changes were made and in the 38th minute it cost the Germans. Kimmich was moving up like a wing often during the half , regardless of the situation regarding German possession and (above) when Mexico took the ball he (white underline) was several yards behind Lozano. When the Mexicans hit a long through pass down the middle Lozano (green underline) was already on the move and had opened up even more of a gap between himself and Kimmich (white underline). When the ball was passed to him, he was so far behind Kimmich that Kimmich isn’t even in the above picture. Lozano scored and that allowed the Mexicans to play a defensive game from then on which the Germans could not beat. And that was the Germans second failing. The German forwards Mueller and Werner did not work together very well and in a 4-4-2 like the Germans were using those two needed to help each other. When they did get shooting opportunities they couldn’t find the goal. Given Low’s decision to operate what amounted to a 2 back system, the Germans were constantly open to counters. Against South Korea their inability to find the goal was telling and when they fell asleep on a Korean corner it was all over. WHAT WAS THE BEST GOAL OF THE WORLD CUP? There were many great goals in Russia this summer and some amazing individual strikes that scored. But to the Soccer Yoda, the best was easily Belgium’s game winner against Japan. It was a masterpiece of team play, unselfishness, modern offensive soccer and all coming at a moment and situation of the game typically reserved for waiting for the whistle to blow. The Belgians had already staged an amazing comeback , scoring twice in the latter stages of the game to overcome a very surprising two goal lead opened up by the Japanese. As the clock moved into stoppage time, nobody could have faulted them from taking a breath and looking forward to extra time to finish a come-from-behind miracle. But the Belgians used a set-up on defensive corners designed to create a strong counter attack and the situation presented itself as the game moved into the 94th minute. They marked man-to-man, left the posts open and put 2 men upfield despite the fact that a goal by Japan would end the Cup for them at that point. But it worked perfectly for the Belgians, the kick was high and 6’5″ keeper Courtois handled it easily. Then the break was on. Courtois took the ball and moved forward. As soon as he saw Kevin DeBruyne (green underline above) he gave the ball to him. The Belgians already had 3 players ahead of DeBruyne moving upfield. DeBruyne (circled above) carried the ball as there was no pressure on him. Roman Lukaku was forward and rather than run straight ahead he made a crossing run in front of DeBruyne (going in the direction of the arrow above). This forced the Japanese defender to choose between following Lukaku or moving forward to cut off any pass to Thomas Meunier who was right of DeBruyne . The defender decided to follow Lukaku, thus opening the entire right side for a pass to Meunier. In the above picture, DeBruyne has made his pass to Meunier because the Japanese have finally moved to pressure him. Lukaku (circled) has turned toward Meunier, but not before seeing Nacer Chadli ( underline) behind him and moving forward. Meunier hit a beauty of a one-touch pass toward Lukaku. But Lukaku was covered tightly, so he let the ball run past him right into the path of the onrushing Chadli. Chadli put the ball into the goal to complete this marvelous play. The key to the move was Lukaku’s crossing run which created the space on the right for Muenier to play DeBruyne’s pass. This type of movement is a major element of the modern game and the Belgian manager Roberto Martinez gets credit for using it with his already talented squad. The Belgian’s chance-taking defensive corner strategy paid off again against Brazil with Lukaku and DeBruyne somewhat switching roles and they scored the winning goal with it. 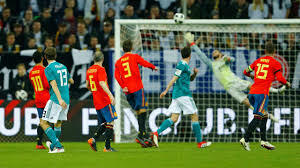 But gambling on defense often catches up to teams and against France the Belgians gave up a corner kick goal at the open near post and it cost them the chance to play in the final. WAS CROATIA REALLY THAT GOOD? For the Soccer Yoda, the answer is a qualified “yes”. International tournament knockout games end in penalty kicks if a winner cannot be decided after 120 minutes of play. This puts a premium on defense and a good PK goalkeeper in addition to good PK takers. Croatia played well in the qualifying group, no questions asked. They scored 7 goals, only gave up one, spread the scoring around and only Luka Modric stood out as an indispensable part of the team. In the knockout stages things became definitely tougher. The Danes and Russians gave them trouble but the Croats were calm during all the stress. Great performances by their goalkeeper Danijel Subasic plus some timely conversions took them through to the England match where they didn’t need penalties to win. It could be said that with Argentina failing to perform well, the first “real” contender they faced was in the French, but Croatia did what was needed for them to advance each round and they added a bit of underdog mystery to the final. Congratulations are definitely in order. WHAT ABOUT THE BIG STARS? One of the exciting parts of any World Cup is to see the game’s best play for their countries. Past tournaments have been marked by outstanding performances by the likes of Pele and Maradona. So what happened this time? Well, with one exception, the stars are still excellent players but their circumstances made it difficult for them. Soccer is a team sport and one player rarely carries a team through a tournament like the World Cup. Argentina knew coming into the Cup that their age and lack of depth was against them. They barely made it out of their group, revolted against the poor lineups and substitutions by manager Jorge Sampoli and eventually got caught in a crazy goalfest against France. They couldn’t keep up with France’s speed and and in the end Messi tried to do too much and couldn’t bring his team back from the two goal deficit in which they had found themselves. Ronaldo had some very good moments especially in the early matches but Portugal’s defense wasn’t the same as in the 2016 Euros and against Uruguay he appeared to be resigned to leaving the tournament. Maybe his upcoming move from Real Madrid to Juventus was in the back of his mind. But Neymar was another story. Unlike Messi and Ronaldo, he did have a quality team beside him. He just didn’t play like it. He took too many touches, tried to dominate the offensive play and rolled on the ground so much he became an international comic video star. Instead of being a part of an efficient fast moving side, he slowed it down and made it much easier to defend. It was Coutinho who stood out for Brazil, not Neymar and eventually the more team-oriented Belgians ousted them from the tournament. WHO HAS COME THE CLOSEST TO BEATING WORLD CHAMPION FRANCE? The French did it right. They got progressively better as the tournament went on and only a scoreless draw against Denmark (who has been unappreciated for their effort in Russia) marred their record. So, has anybody come close to beating the French in recent months? After all, they haven’t lost in their last eleven matches. Actually, yes, and it is very surprising who it was. The much-maligned USA! But this wasn’t the Bradley – Dempsey squad who couldn’t get past Panama or Honduras and into the tournament. No, this was a very young American team playing their third game during the pre-tournament weeks when teams actually in the Cup are preparing themselves. With the exception of some very questionable goalkeeping, the young USA had looked amazingly capable against Bolivia and Ireland, but this was the full French…and looking to finish their preparation games with a flourish. Despite the names and talent in front of them the Americans did some very good things and when Julian Green scored in the 44th minute, the French and everybody else in the soccer world were stunned. Eventually the quality of their opponent overwhelmed the underdogs and World Cup-star-to-be Kylian Mbappe evened it up at the 78 minute mark, sparing the French a very embarrassing result. But it was a very encouraging effort for the USA and hopefully one day in the future we will look back at that game as the first sign of the development of a very good USA team. All in all, most fans have said that this summer was the most entertaining World Cup in decades. It certainly was fun to watch and it will be remembered for it’s drama, upsets and exciting play. This week the most followed sports event in the world begins its once-every-four-year occurrence. The World Cup takes place in Russia and the eyes of almost the entire sporting world will be on the teams and the games as nations attempt to claim the title of best national soccer team in the world. This year some usual participants will be missing. The innovative Dutch , the defensive-genius Italians, the not-so -good but economically welcomed Americans. It will be a telling measure of interest in the sport here in the USA as we see what the interest level is without our team’s participation in the event. The Russians are hosts and although they are old, slow, overly physical and with few players playing outside of Russia, being host tends to bring out the best in teams and their supporters. The Uruguayans are easily the best of the group, especially if Luis Suarez remains on good behavior when not playing for Barcelona and doesn’t bite anyone. Egypt might have a chance but Mo Salah’s shoulder is a huge question mark. The Saudi’s had a great qualifying run but seem out of their league here. The Iberian Peninsula will own this group, but predicting the winner is tricky. The Spanish have a good mix of youth and experience while the Portuguese have Christiano Renaldo along with some other quality players. The Spanish lack a true world-class forward, but every other position is loaded. Portugal is better up front but the Spanish have the team and the experience to finish on top of the group. The French are as filled with top quality players as anybody in the tournament. From back to front, top to bottom the likes of Griezemann, Pogba, Kante, Mbappe, Varane, etc. will be a threat to take it all. Previous French teams have folded due to the pressure of the tournament, but this one could be different. Runnerup is a tossup…Peru can be decent but are missing one of their best due to injury, Australia can surprise and the Danes have a couple very good players. Messi and friends will take this group but Croatia has a midfield that can compete with anybody. Iceland is the tournament sentimental favorite but let’s be realistic, this is, after all, the World Cup. African teams have surprised in the past and the Nigerians could take second…..but if midfields really do win games then Modric, Rakatic, and Kovacic will get Croatia out of the group. Actually, I don’t believe that the midfield is as indicative of who wins a match as some observers do, but I’m picking Croatia anyway. Of course Brazil is the easy favorite in this group, but like several other groups second place is up for grabs. The Swiss were once the Cinderella of Europe, a spot now occupied by Iceland and they aren’t as strong as in previous Cups despite a high ranking by FIFA. The Serbs have some capable talent, especially Matic from Manchester United and Kolorov ,a good defender who plays for Roma. But the mystery squad is Costa Rica. On paper their goalkeeper Navas is the only top caliber player, but they surprised in the 2014 Cup ( which earned Navas his job at Real Madrid) and they appear to be stronger than four years ago. Logic says the Swiss should take the 2nd spot but my pro CONCACAF leaning tells me the Ticos will get out of the group. The favorite in this group is no secret, but unlike many other groups the runner-up seems apparent also. The Germans have been the most consistent high finisher for decades and that isn’t going to change this time. But Sweden isn’t as strong as usual and South Korea is a bit of a mystery, having qualified in a weak group, then switching coaches and going to a youth movement. Meanwhile Mexico has an experienced squad that can trouble many teams in this tournament, though the top teams seem a couple steps beyond them. Finally a group with a battle for the top spot. The Belgians get the award for “best team coming from a little country”, usually reserved for the Netherlands. They are loaded in most positions but have a history of underperforming…having come within a Chris Wondolowski fluff ( and a potentially horrible offside call) of losing to the USA in 2014 and then failing to dent Argentina. England, meanwhile, has a solid if unspectacular lineup, unless one counts Harry Kane as a world class scorer. Panama and Tunisia will be trying for respectable losses except when they play each other. I”m taking the Belgians on their talent, but England could win the group, despite my prediction. This might be the most interesting group in the tournament. Poland looked very good in qualifying out of Europe and Colombia has a lot of that magical South American talent. Senegal has some quality players and if Mane can make better decisions on the field with Senegal than he has with Liverpool, they could score some goals. Japan has lots of energy and hustle but should be a step behind the others in quality. This is a tough call, but Colombia has the ability to take the group and Poland’s experience should take it past Senegal. This will be a great group to watch for scoring, they can all put the ball in the net. Based on the above predictions, these will be the first knockout round matches and winners. There will be some very good matchups in this round. Uruguay vs Portugal – This is one of the early knockout round heavyweight clashes. Both teams know that on paper they are a step below the top favorites, but also believe, with luck and a couple good performances, they could be in the run for the semifinals…at least. But that means getting through this match. Uruguay has top quality in Suarez and Cavani up top and Godin in the back. But the midfield is young and inexperienced. Portugal counters with Renaldo, Quaresma and a quality midfield. They are aging in the back, though. Therefore I expect a high scoring game with Portugal’s ability and experience coming through. Spain vs Russia – The Russians will have the crowd and Putin behind them , but even that won’t get them past Spain’s quality, experience and overall superiority. France vs Croatia – Another clash of quality teams in the round of 16. Croatia boasts an excellent midfield of Modric and company. Mandzukic and Perisic provide goal scoring and Lovren improved drastically during the year to lead a decent back line. But France has it all…..if they can get over …being French….which means they must work together and keep off-the-field distractions to a minimum. If they can do that, they will run past the Croats. 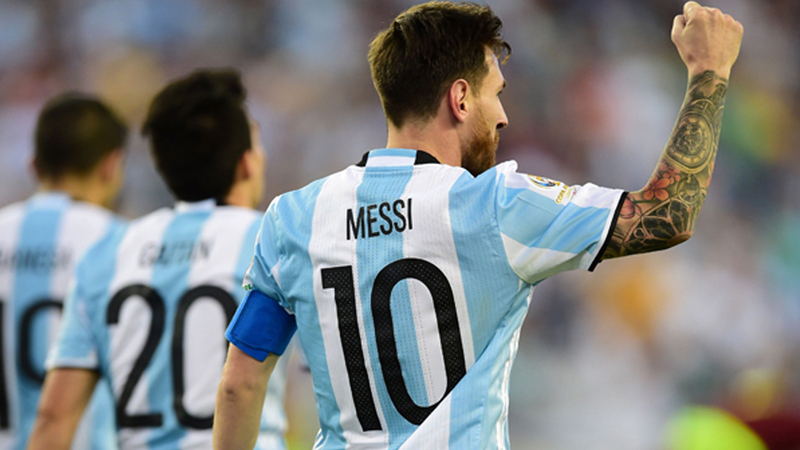 Argentina vs Denmark – This is a cakewalk for the Argentinians. Denmark has enough to get out of it’s group, but that effort will leave nothing left to battle a top squad like the South Americans. Brazil vs Mexico – If there is a big early tournament upset, this could be it. The Mexicans have some talent, they play together well and the Brazilians can be inconsistent. However, Brazil has a 7-1 2014 loss to Germany to constantly remind them that it takes total commitment in a World Cup and I don’t think that this one gets past them. Germany vs Costa Rica – Costa Rican keeper Navas will have a very busy day and will show why he is considered a world-class goalkeeper. But the Germans will still get something in the goal and that’s likely more than the Ticos will do. Belgium vs Poland – The Belgians have Hazard, De Bruyne, Lukaku, Kompany…..and that’s not all….it sounds like a Premier League all-star team and they have Courtois in the goal to boot. The Poles have a good qualifying record. They scored lots of goals, but more importantly, they gave up alot also. They won’t be able to hold off this much talent. Colombia vs England – Ok, this might be the biggest game in the round. The Colombians have some excellent players but England has a full complement of decent players themselves. Kane and Vardy have something to prove on the world stage and the midfield of Alli, Henderson and Lingard is good enough to supply them against this opponent. Call me crazy, but I like England in this one. Portugal vs France – This round gets down to the basics of who are true contenders for the Cup and who are not. IF (big IF) the French play up to their talent, they are better than Portugal, even if Portugal does have Renaldo. Brazil vs Belgium – Wow, a game for the talent appreciators of the world. Brazil has Neymar, Coutinho, Firminho, Jesus, Thiago Silva, Marcelo ..just to name a few. And, in a major change for Brazil…a great keeper in Alisson. Belgium has the aforementioned Premier League all-stars. This is a match for the ages and Brazil comes through due to their …..Brazilian…..ability to create great plays. Germany vs England – The Germans are loaded as usual and ,of course, can play like a fine-tuned machine at times. Their defense comes complete from Bayern Munich and includes arguably the best keeper in the world in Neuer. Their midfield has so many good players they could probably supply a couple other teams and still have a great midfield left over. If they have a weakness it is depth up top where Mueller, Werner and Gomez are talented but have no replacements except from the midfield. Their forwards may cost them eventually, but not against a good but not great England side. The Germans will advance toward the top, as usual. Spain vs Argentina – Another great match. Messi needs a World Cup title to call his own and he has help up top with Aguerro, Higuian and Dybala. But the rest of the squad is somewhat weaker than the forwards and Spain has the talent and depth to take advantage. Perhaps more significant, Argentina has trouble playing together and up to their talent level. Spain has no problems playing as a well-oiled machine. In a friendly, Spain blasted Argentina 6-1. It won’t be that bad, but Spain will win this and leave Messi still without the big trophy. France vs Brazil – Only once have the French have been consistently good throughout the tournament and that was at home. Brazil has won the championship five times and although playing in Europe has been a problem, this group plays for European clubs and being far away from home won’t bother them. I think their inconsistency catches up to the French against the talent and experience of Brazil. Spain vs Germany – Neither team has a wealth of scoring power, but both can boast experience and talent everywhere else. This could be a classic defensive battle, but if I had to put my money on one of these sides putting together a magical goal it would be the Spanish. Iniesta, Isco and Silva can put a great goal together and that will be enough to down the Germans. The Spanish have this crew again, although a bit aged. Brazil vs Spain – Two great teams with the utmost of respect for each other. It’s a long tournament and by this time a month of frequent matches will take it’s toll. The Brazilians are younger, faster and more likely to have the energy and depth to break through at this point in the tournament. So there it is…….the Soccer Yoda has spoken. Now lets see how my bracket stands up to the craziness of world soccer. One thing is for sure though. This will be a great World Cup to watch, even without the USA. Please note that the opinions expressed in this post, particularly in regard to training methods, are those of the Soccer Yoda, although many soccer institutions, agree wholeheartedly. Well, it’s that time again…again. Each year around the end of May soccer clubs around the country have their tryouts. This year there is more expectation and more urgency as to how America’s children are coached, so that they can reach their maximum potential as soccer players. Why this year more than others? Because the USA men’s team did not qualify for the World Cup. Because the likes of Panama and Honduras finished above us in the 6 team playoff round. As a result there has been a huge amount of introspection as to the reasons this soccer-world catastrophe occurred. And our youth coaches have been among the most accused. And rightly so. The drive for most all American soccer clubs to grow manifests itself into a drive to attract parents with money to spend on their kid’s soccer. And that frequently means to shortcut the development of players in order to produce immediate victories that attract more players. Sometimes it means to use training methods like “speed and agility” or “strength and conditioning” training that forego the use of a ball but sound great to unaware parents. Sometimes it means small areas to train because of an over-sized club. Sometimes it means a coach who is also coaching 2 or 3 or even more other teams as a means of increasing income and therefore cannot provide the personal touch so important to youngsters. And sometimes the coach just doesn’t know any better. Last year at this time, I posted a well-received “here is what to look for” piece for parents who want their child to have the best soccer experience in terms of development and fun. In light of this past year’s disappointment and subsequent attention to youth soccer training methods, I am posting it again, with some additional up-to-date comments. Success in soccer can be defined in many ways and is usually dependent upon the goals of the player and his/her parents. These goals can range from “be prepared for a pro career” to “have fun and don’t break anything!” We know that only a minuscule percentage of kids will play professionally and that, despite the dreams of so many families, only 5.6% of boys playing high school soccer will play in college (according to the NCAA). Statistics are about the same for girls, except the number playing pro is even less than the boys. We also know that not all youth players will even be proficient enough to play for their high school and even less will make those controversial high level programs that take the place of high school soccer for some of the very gifted. So, this means that we must recognize that life lessons that carry beyond soccer are extremely important for our young players if they are to carry benefits gained from their soccer experience for the rest of their lives. But it is not the purpose of this post to discuss the non-soccer learnings that can be derived from the sport, as important as they may be. Here is why…..unless youngsters are having fun they tend to drop out within a comparatively short span of time. At that point they aren’t getting any life lessons from playing soccer anyway. Although other factors may drive a kid from the sport, failure to improve skills is a leading cause of the “this isn’t fun anymore” syndrome. After all, it is fun to learn and get better and often boring not to do so. And of course if a child does harbor dreams of advancement to higher levels, learning new skills is a must. It is possible, even if a child loves the game enough to keep playing for years, that skill development can be neglected by coaches. I have seen, not very long ago, youngsters who were veterans of a number of years of soccer and yet could not use their opposite foot, couldn’t use the outside of either foot, didn’t know the offside rule despite playing with it for years and whose tactical knowledge consisted of “the goal is down there, why don’t we just kick the ball down there?” Once upon a time that might have been expected, although not preferred, because so many youth coaches were moms and dads with little or no soccer experience who were volunteering so kids could play. Not today. Parents are spending good money and devoting more time to the demands of the soccer club than to be satisfied with a lack of soccer growth in their children. One problem is that, to less experienced parents who are paying so much attention to game action and scores, it is not easily apparent if their child is not advancing. If they spent money on a piano teacher for a couple years and their child was still playing the same songs as when they started, they would know something is wrong. But it is not nearly as obvious if their youngster is still playing the soccer equivalent of Chopsticks after years of soccer experience. Other countries are not nearly as dependent on coaches to develop their soccer talent. Brazil, Italy, Argentina, Germany……these soccer powers have a culture to help produce talent. 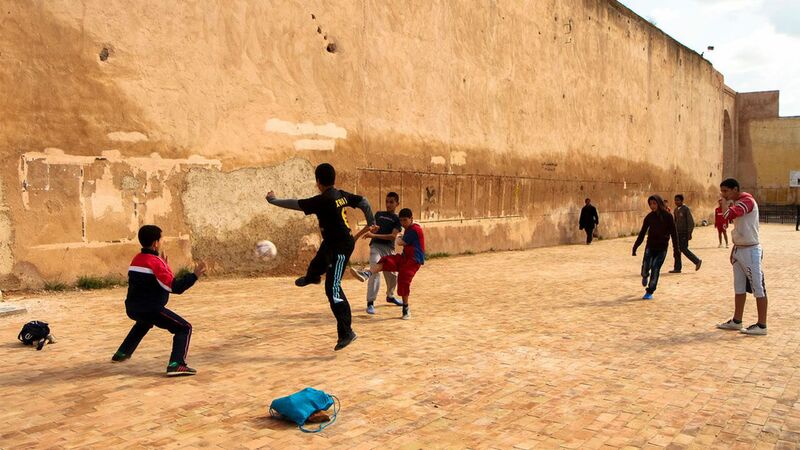 Kids play for hours a day in the streets or neighborhood fields in small groups, with makeshift goals, emulating their “football” heroes that they see on tv. There are no coaches, no parents, no recorded scores or tournament championships to be had. Just kids having fun playing the sport and trying new skills with no negative feedback if they mess up while learning. It has been said that the more our youth training is like playing in the streets the better our kids would learn. Soccer is a sport played with the players feet, brain and heart. Although playing with lots of heart certainly helps achievement and is one of those “non-soccer” attributes parents want their children to develop, the deciding factor in the consideration of the achievement level of any player is far more often the players feet and brain than his/her heart. And it is in those areas, the feet and brain, that good coaches stand apart from the ordinary. So lets look at the methods used (or not to be used) in order to produce soccer players who are at the top of their potential and are having fun while constantly improving their game. A top German professional coach said to me once,” You know what you get when you have your players run lots of laps? Good lap runners!” Youngsters need to touch the ball to develop ball skills. The more touches done right, the more proficient they become. Running done without a ball or not in a soccer situation does nothing to develop the ability of a soccer player. Of course, the “win” syndrome plays a part with coaches who run their players. Coaches may feel that they can make up for a lack of skill and tactics by being in “better shape” or “more aggressive”. But 1) just running is not fun to most kids and 2) eventually kids and teams who can use their feet and brains on the field pass those who can’t, no matter how much those latter teams can run or how fast they can get to the ball. For older kids cardio work may be needed, but it can be gained by exercises using a ball. Beware of “speed and agility” sessions that don’t use a ball. Last January Barcelona spent $190 million to acquire Philippe Coutinho, a player who is not fast or strong or big and, in the age of “all positions play defense”, plays virtually no defense at all. But he is a magician with the ball. Parents should remember that. B. Practice should be efficient, lots of soccer and less of other things. Now there are 3 times as many players involved. If the coach makes this a game condition drill by putting a time limit on the encounter in the middle , the work and rest times resemble those during a game where there is a period of high action followed by a period of less. In regards to methods #A and #B above, the USSF has long preached the no “L’s ” concept…..” no laps, no lines, no long lectures”. C. Use the “teaching progression” to develop skills and concepts. No pressure or opposition – players practice the move or skill without anything forcing the action. They can take it slow, practice by trying one step at a time, make sure of what they are doing. An excellent dribbling practice: players each have their own ball and space is limited. 3. Low pressure – use of numbers is a great way to introduce active pressure but still provide a transition from no active pressure to game conditions. 5 v 2; 4 v 1, etc. Introducing team shape with small numbers of opponents works well to familiarize kids with positional responsibility without discouraging them. 4. Increasing resistance to full and beyond – gradually making the numbers of the opposition more equal or limiting time and space to game conditions can prepare players for game action. For advanced teams adding even more opposition players ( 4 v 5; 8 v 9 to a goal) can make games seem easy. D. Lots and lots of “rondos” – Rondos are drills in which one side outnumbers the opposition and the emphasis is ball possession. As noted above, these are great for building ability when used with youngsters, but even the best teams in the world practice using this concept. Lately the USSF training gurus have decided that rondos do not simulate the game enough and are not in favor of them. After talking to many experienced successful youth coaches, they and I strongly disagree. Repetition develops skill and these activities supply those reps better than other exercises. The individual drill can be modified to fit the learning objective desired. Touch limitations, single foot usage, dribble requirements…..if it is a part of the game it can be practiced in a rondo form of exercises. A form of rondo can even be used with a goal….ex: the offensive team must complete 5 passes consecutively before shooting. The German coach I quoted above finished his statement about laps with,” If you want good soccer players, they must play soccer!” Rondos and conditional scrimmages are the closest thing we have to the “street soccer” that international youth play and might even be more efficient due to the specific purpose of the play. E. Make it competitive – kids love to play, but they also love to compete. Those Brazilian youngsters on the beach are always keeping score, even if the outcome is forgotten as soon as they go home. Coaches will keep the interest and the fun levels of their players high if they devise ways to keep score in their exercises. For instance: Passing: a point for every x number of passes ( depends on the skill of the players) Dribbling: a point for every stepover (or whatever move is being emphasized) accomplished in the rondo. Shooting: a point for every shot on goal and 5 points for scoring. The coaches imagination or a good practice manual can provide different scoring scenarios, but competition tends to drive practice energy upwards. These methods will be very beneficial in making practice fun and improving the ability of players at a high rate. What skills should young players be developing? 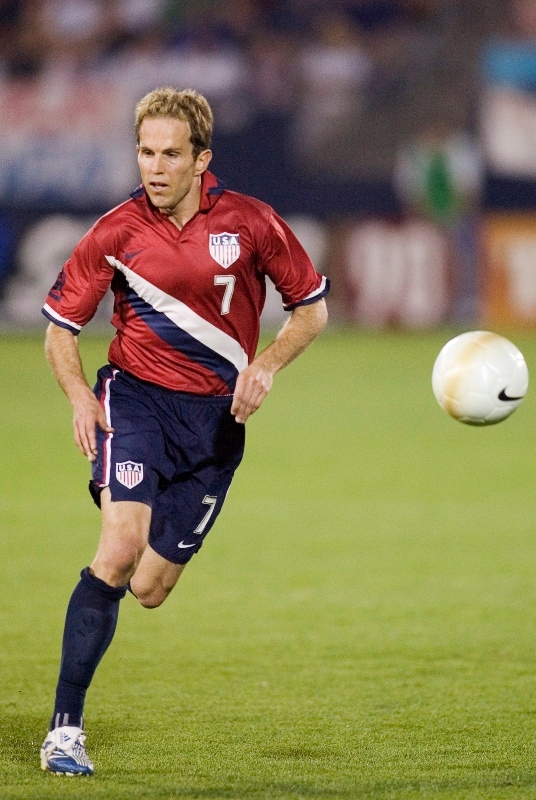 Ball Control – Good soccer begins with good ball control. Players must be able to receive the ball and make it playable immediately. Young players learn to receive the ball with the inside of both feet (all skills should be learned with both feet) . Then with the outside of the foot. The ball should be put in front of the receiver just far enough to play it with the next touch. As kids learn, they should be able to move the ball away from defenders with their receiving touch. This leads to the ability to play 2 touch soccer, but the initial receiving touch is all important. Body surfaces should be used to cushion the ball for play. Thighs, midsection, chest ….youngsters need to develop the ability to use all surfaces. If one watches a mid-level ability professional team and compares that to the worlds best, the difference in ball control is very evident. The great players have great control. Passing – For youth players passing is the skill that starts them on the road to advancement. Inside foot ( both feet of course) is the basic and most used pass in the sport. Outside foot and laces passing adds the versatility and unpredictability of a players passes. To pass effectively players must have their heads up to see who should get the pass. This is an extremely important concept for young kids……getting their heads up with the ball is an absolute necessity. This skill must be practiced often and in different situations to develop proficiency. Dribbling – Dribbling is a required skill for aspiring players. Youngsters should learn to move forward while keeping the ball close . Use of both inside and outside of the foot needs to be stressed. The ability to change direction with either surface accompanied with a feint to the opposite direction is an easily learned first “trick”. Then stepovers, cuts, pullbacks, etc can be added. Experience has shown that young players can develop these moves much earlier than many coaches believe. One point in regard to training dribbling moves: I have seen many drills in which the dribbling player gets 10 seconds, 15 seconds, even more time to try to beat a defender. This never happens in a game. Coaches need to keep to “game condition” exercises and with dribbling that means giving the offensive youth one quick try per attempt to make the move work successfully. Receiving and Turning – turning as a part of receiving a pass is probably the most important skill in the game that is also the most neglected when it comes to training. The ability to receive a ball and turn 180 degrees quickly with it is very important. Kids can start with a basic inside of the foot 2 touch turn, but once that is mastered they should move on to one touch turns. These include outside of foot swivels, inside of foot hook turn, and the behind-the-heel ( also known as the Cruyff Turn). The ball should be ready to play as soon as the turn is completed. As players advance they should be able to confidently and quickly take a ball from the back, turn and play it to a teammate. Shooting – Youngsters catch on to shooting fairly easily as far as form is concerned. However accuracy can be challenging to any age player and youth are no exception. The smaller goals now required by the USSF make training to shoot more productive than with adult goals. Keeping shots low and on goal is paramount. Shooting with the outside of the foot and putting spin and curve on shots are not above the level of experienced youth players. However, it takes many practice attempts to become a good shooter so kids need to get many repetitions to improve. Proper shooting form is important at all levels. Heading – Due to the unknown potential of injury to still-developing skulls and brains, the USSF has banned all heading (practice or games) for youngsters age 10 and under and minimal heading for those 11 and 12 yrs old. If a parent has a teenager playing, expect basic heading exercises and heading in games gradually leading up to the expertise expected in advanced players. Defending – By definition playing defense is not a ball skill. Still, youth players need to understand the basics of defense. Parents should expect their kids to know about position ( goal side), footwork, patience and proper tackling technique. As they get older youth should learn team defensive strategies such as sheparding and maintaining shape. Team Play – Once it was said that younger players could not understand team tactics and therefore only technical skill should be taught to kids. It is my belief that is absolutely wrong. Coaches should never underestimate the ability of youth to develop their feet AND their brains in regard to soccer. They can learn proper support moves, how to get to good angles, when to move to space, what their positional responsibilities are and those of their teammates. I have seen and coached u-10 and u-12 teams that play a high level of tactical soccer and they loved learning the game. In addition. it should not be a surprise that kids get better at things that they practice. By stressing and practicing team possession tactics, youth players also develop technical ball skills of control, passing, dribbling, etc. to accompany their always improving vision, movement and team concept. WARNING: while learning the “good game”, kids make mistakes and this can lead to losses on the field, especially to teams that are athletic and big and fast, even with the new rules that are designed to minimize those physical advantages. But, make no doubt about it, time spent developing these soccer skills…..the feet and brains of youth players, will pay off in the end. It’s the lucky kids, those whose coaches teach them to know the game and love playing it, that will stick with it and experience those events that make for livelong memories, great friendships and personal traits that can lead to fulfilling lives in many diverse areas. And a few may even be a part of a USA team, of either gender, that can qualify and advance in the World Cup! Soccer Yoda would like to thank the many readers of this blog. In the last couple months soccer fans from many countries around the world have become viewers. It is quite an honor to have an audience as widespread and diverse as this one has become. Thank you all! This past week the European Champions League played it’s first leg of it’s quarterfinal matches. As expected, Barcelona did well against Roma, winning 4-1 and Bayern Munich downed a surprisingly stubborn Sevilla team 2-1, in Spain. This makes Bayern a large favorite for the overall result given the second leg will be at home. Liverpool astounded everyone, especially Manchester City, in thrashing them 3-0 at home. It remains to be seen if City can come back in Manchester this week. The big contest, pitting Real Madrid against Juventus in a repeat of last years final proved to be disappointing, unless one is a Real fan. Madrid rolled to a 3-0 win, and in Italy no less. In doing so, Real scored a terrific goal that caught the eye of the Soccer Yoda in it’s application of modern soccer tactics. And no, I don’t mean Ronaldo’s overhead scissors goal. That was an amazing display of technique and athletic ability. That kind of skill can decide matches regardless of whatever tactics are being applied. The goal that impressed the Soccer Yoda so much was the third one, scored by Real’s left back Marcelo. It involved a fair amount of technical skill with the ball, mainly the ability to control a pass to feet and the ability to deliver an accurate pass under some pressure. But what it really demonstrated is that an understanding of space and movement can beat the best defense. And the fact is that this understanding can be taught to youth. At the beginning of the move (above picture), Ronaldo has the ball in Real’s attacking third. He is moving with a deliberate slow pace. Marcelo has moved up the left side and is position to support Ronaldo. Farther away on the right Isco is literally in the picture but is a tough pass for Ronaldo. It should be noted that Juventus has 5 defenders in the area and another moving in from the far right. Real has 3 attackers against 5+ defenders of one of the best defensive teams in the world. This doesn’t look like a positive situation for the Spaniards. With no penetrating move available and Juventus defenders closing in, Ronaldo makes a safe pass to Marcel0. Meanwhile Isco sees space open behind the 3 defenders marking Marcelo and Ronaldo. He starts a diagonal run into that space using the concept that attackers away from the ball should make runs into space left open by the defense. Marcelo takes the ball inside toward the space while Isco continues his run across the defense. Isco’s run forces the Juventus defenders to decide whether to stay where they are or to follow him as he moves into an open area. Isco’s run takes him into the space and the defenders decide to move with him to prevent him from getting the ball unmarked in a dangerous area.But diagonal runs that are properly made allow the receiving player to shield any following defender with his body and Isco can take a pass from Marcelo while shielding the defenders. So Marcelo slips Isco a short pass using the outside of his left foot. The diagonal run has taken 2 Juventus defenders out of crucial areas and now there is a large open space inside the Italian penalty area right at the penalty spot. But how to get the ball into that spot at a Real player’s feet and at the same time keep that space devoid of defenders? Isco is receiving a pass with a defender on his back preventing him from turning with the ball. This is a classic “man on” situation in which the receiver being pressured passes the ball back to the original passer. In this case, the original passer has moved since making the first pass. The defender marking Marcelo has turned to watch the ball and lost sight of Marcelo who is now in a good position to receive Isco’s return pass. Marcelo has the ball he obtained from Isco. That big open area at the penalty spot (opened by Isco’s run) is still there but Marcelo is surrounded by defenders and the chances of carrying the ball into that spot past all those defenders is slim. However, Ronaldo has followed one of the basic concepts of possession soccer. He has put himself into a position where his close teammate with the ball can reach him with a pass. Marcelo knows that although he would have trouble reaching the open space with the ball, there is another way. Marcelo takes advantage of Ronaldo placing himself on a line with him. He passes the ball through the surrounding defenders to Ronaldo. But he knows the importance of that empty space in front of the goal and he continues his movement toward it after making the pass. Ronaldo receives the pass from Marcelo and although he could shoot from where he is, he sees Marcelo making the run toward the penalty spot. Juventus defenders have been turned again as they follow the ball. Each turn costs them a couple steps and so they seem rooted to the ground while the Real players move around them. Ronaldo makes a “second side” pass to take advantage of the turn and cause the defenders to lose sight of Marcelo. A “second side” pass is made to the opposite side of a defender than the side that the offensive runner is on in respect to the defender. Since the ball and the runner are on opposite sides of the defender he will not be able to keep both of them in sight. In this case, the Juventus defenders are watching the ball and lose sight of Marcelo. Marcelo is meeting the ball in open space with only the keeper to beat. The defenders are calling for offside, but Marcelo timed his run to coincide with Ronaldo’s pass and he is not offside. Ronaldo gets the assist for the prospective goal and the player who created the goal by his run is standing alone watching the culmination of his work. Isco knows that he played a crucial role in this score even though he neither scored nor assisted on it. In modern movement-oriented soccer, many times the player whose movement opened the defense is not part of the actual scoring of the goal. Ironically, Marcelo fumbled the actual shot on goal, but the position and lack of defenders around him allowed him to stumble into the goal with the ball. Real was up 3-0, the game and likely the movement into the next round was settled. Real scored with only 3 players against a number more defenders by using modern offensive concepts that involve possession by having close support, movement by players into space from off-the-ball locations, forcing defenders to make choices as to their position and then taking advantage of those decisions. This may seem like extremely high level play reserved for only the best of the best in the world. It is not. The basics of this style of play can be taught to single digit aged youngsters. As they become familiar with possession and simple movement they can learn more complex strategies like diagonal runs, second side passes, decoy runs designed to move defenders away from important areas and more. And while they play this type of offense they develop the technical skills of control, passing and vision that this style of play needs to be successful. If American youth coaches were tuned in to developing these ideas and skills in our youngsters, we would not be worrying about qualifying for the World Cup. It can be done, we just need to educate our coaches to teach our youth and eventually the USA will have our own Isco, Marcelo and Ronaldo scoring goals like this one. There are many wonderful things about the holiday time each year. One of the best practices during late December is the telling of stories that carry a positive outcome and often offer a meaningful lesson to accompany the tale. We see uplifting movies like “It’s a Wonderful Life”, “Miracle on 34th Street” and “Home Alone” that use the Christmas and New Year period to make us feel great and teach life lessons to boot. The Hallmark Channel devotes weeks to the telling of tales that end with problems that are solved through the learning of lessons that are important all year long. In keeping with that tradition, the Soccer Yoda would like to tell a story, at this time of year, that like those mentioned above, has an important life lesson to teach and a positive outcome to make the reader smile. This tale is true and, of course, it’s a soccer story. What it isn’t- is a Christmas story- I decided to use the season as an excuse to relate a real-life happening that still reminds me of an important lesson I and a group of teen-age boys learned a long time ago. 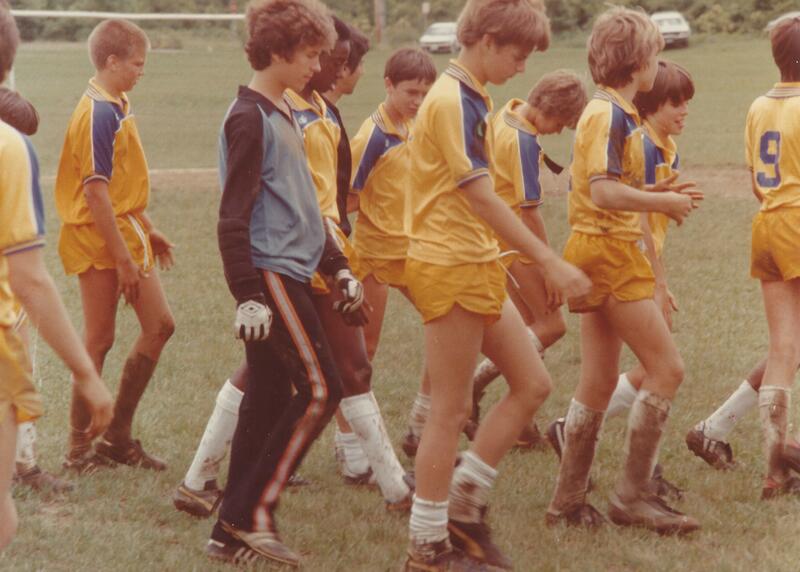 In the summer of 1984 I was into my fourth year of coaching a team of boys living in Columbia,Md. 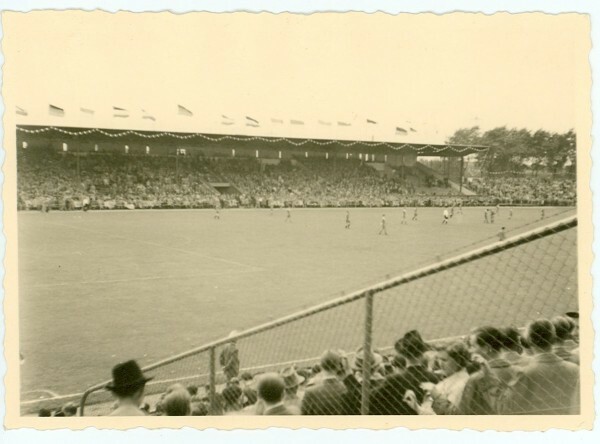 The Soccer Association of Columbia was formed in 1971 and had grown into one of the stronger soccer clubs in the East, producing a number of Maryland State champion teams as well as several Eastern regional titleholders and a national championship team ( and more were to come in the near future). My team was a good team, we had risen from the Washington DC beltway league’s 3rd division all the way to the first and we were looking to continue that improvement. To that end, we decided that a trip overseas could have a great impact on the boys. A word about team names – it is common practice here in the 20-teen years to name youth soccer teams by a specific process: the name of the club comes first, then the year of the players birth, then either a color or a level description (or both) or perhaps the coaches initials to indicate which particular team it is. So a team at the same level as our story team ( u-16, top team) would be named SAC 2002 Premier Blue at the present time. Under the present system we would have been SAC 1968 Premier Blue. But back in the 70’s and 80’s team names were different. There were fewer teams at that time and many clubs including ours used team names to inspire loyalty and pride. For while “SAC 1968 Premier Blue” might be descriptive, it certainly doesn’t raise any passion or identity. All SAC teams went by the name “Columbia” ( it helped that there were no competing soccer organizations in the city at that time) and had a nickname that was unique to that team in the organization. Therefore there were Columbia Eagles and Columbia Strikers and Columbia Comets and the like. We took the name of the top professional team in the country and thus were the Columbia Cosmos (it was a nice alliteration and the fact that I had an ex-player of mine on the actual Cosmos didn’t hurt the idea). In that summer of ’84 our team went to Europe to play and learn from the best European soccer nations at that time , Holland and Germany. I had made this trip before with an older team and it was very worthwhile on many levels. We were going to travel through the Netherlands, Germany and Belgium, play 8 games and learn as much about soccer and Europe as we could. 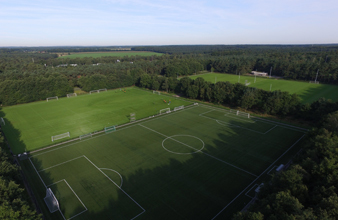 Our first stop was at the Dutch National Training Center at Papendal which is located just outside of Arnhem. There we would train for a short week ,play a game against local competition and then head out to Germany. I had been at Papendal before, it was (and is) a terrific facility which is used by many teams and clubs for training purposes and in the summer it is especially busy. On this trip we were joined at the facility by a first division Greek squad and a Dutch soccer camp consisting of about 200 boys ages 8-16. We stayed in dorms and ate meals at a cafeteria used by all those using the center. We arrived in the evening and the next morning went to breakfast before our first training session. During the meal one of the boys came to me and said,”Coach, is it just me or are those Dutch kids staring at us?”. I glanced around quickly and remarked that I didn’t see anything unusual. Our sessions went well, the fields were perfect, the weather was great. But as each meal occurred, the boys became more convinced that the camp kids were staring and laughing at them. This bothered them far more than it should have and began to have an effect on their overall experience at the center. I tried to assure the boys that being Americans, they would normally attract some degree of attention in Europe and these were youngsters who had probably never seen an American at all. “They know the USA isn’t very good at soccer and they are laughing at us” was the general thought of the team though. Given that all were there to play soccer everyone wore the same general apparel and hair styles were no different from each other, so that the only reason the Dutch boys gave our team extra attention was a perceived ineptness on the field, or so my kids surmised. “Coach, they haven’t even seen us practice, how do they know whether we are good or not? Just because our national team can’t make it to the World Cup?” I still wasn’t aware of any extreme behavior at meals but the kids insisted that they were being disrespected and I did notice some added attention paid to them at times. As they were itching to play a match on those grass-carpet fields I decided to talk to the camp coaches about a game between us and their best u-16 campers. The camp coaches asked if I could wait a day for their answer as they needed to talk to their director. The next day they told me that the director had decided that if any of their campers were hurt in a match with us, they would be liable for damages and parents would be very upset if that were to happen. I understood the caution but the team wasn’t happy. “They laugh at us but they won’t give us a chance to prove we can play.” As I ran a soccer camp myself I understood the caution and explained the reasoning to the boys. They calmed down but it was evident that they really wanted to prove that they (and therefore Americans in general) could play the game at least as well as an assortment of camp kids. This was bothering them to no end. Finally the last day of our stay arrived and in the evening we were matched up with the best u-16 team in the area. Our team was very ready to play and out-hustled the opposition during the first 5 minutes resulting in a scrappy goal for us. This fired the boys up even more but the Dutch team started putting together some good passing moves and held the ball in our half for a few minutes. Suddenly we took possession and then put together as fine a counter-attack as one would see at that level… a fast series of three balls down our flank followed by a centering pass to a late running central midfielder who found the net with one well placed touch. The boys went crazy, the opposition slumped….and then the kids noticed the campers watching the game from the hill overlooking the field. If anything they were now even more energized than before and by the time it was over we had decimated our foe 7-0. It took me a second or two……and suddenly it all fell into place …and I felt somewhat ashamed. My team and myself among them had totally misinterpreted the campers. Our own doubts and insecurity had allowed us to completely misread these children. European professional clubs, especially the larger organizations , have youth teams to groom potential players for the senior team. Many of these youngsters end up as stars, others don’t pan out. At present MLS clubs are developing youth teams like their European counterparts. In 1984 the Cosmos were a world-famous team. They had brought world renown players like Pele, Franz Beckenbauer, Giorgio Chinaglia, and others to New York in order to build a soccer organization that would provide a base for the growth of the game in the USA. Given the talent level of the team, any youth playing in the Cosmos organization would naturally be considered to be extremely talented and a probable future star. 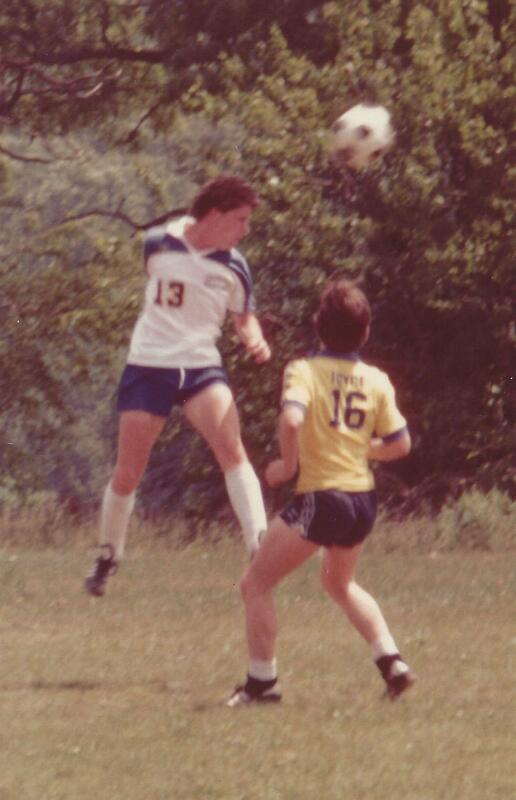 The campers were staring at the Columbia Cosmos in the mistaken belief that we were the NY Cosmos u-16 team ( which did not even exist at that time) and the rout of the local team that they had just witnessed convinced them that we were the real deal…..which we were not. A little communication during the week could have cleared up the confusion and perhaps forged some friendships, created some international understanding and, while costing my boys their moment of false celebrity, it could also have spared them their week-long anxiety. Communication can solve many misunderstandings, and once the barriers were broken down, even for just one short evening, we found that the love of soccer made for a great commonality. During our trip we were treated like royalty by so many great people. I am happy to say that perhaps the experience at Papendal had an effect as the boys had a wonderful time, made many friends and found ways to communicate with citizens of three different countries. We also won almost every game , even defeating a German Regional Championship team who underestimated us badly. Our one loss was a fantastic game against a REAL professional u-16 team when we played Schalke 04. Schalke is a long time successful first-division German club and we were lucky enough to play their u-16’s in their former stadium, the Glückauf-Kampfbahn. The stadium held 34,000 people, we played before about 50. We lost 2-0, which sounds excellent considering the competition, but in all honesty, if we were awarded a goal for every time we got into Schalke’s defending third, we still would have probably lost. For a squad that considered itself a possession team, we learned what possession was truly all about. But that was fine, after all that kind of learning was the point of the trip. Schalke 04’s stadium during a filled house game. We played before about 33,950 fewer fans than this. Members of the Columbia Cosmos have done well. Many were the nucleus of an undefeated state championship high school team. Members of the team played in such diverse colleges as Catawba College, Jacksonville St, UMBC, Dartmouth, U of Maryland, US Naval Academy (captain!). While ex-Cosmos have succeeded in many different careers, there are some still attached to the game, coaching in places such as College of Charleston, LSU, U of Maryland, Loyola College, U of North Carolina Greensboro. 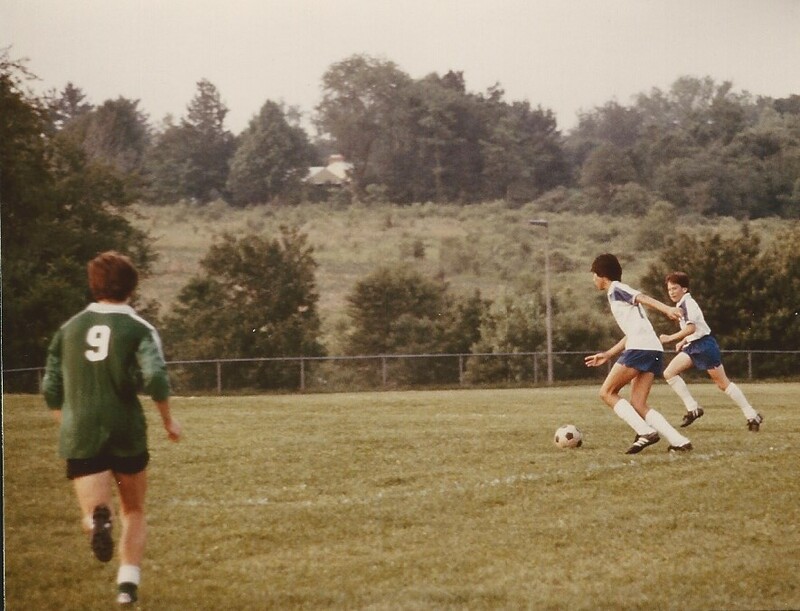 The Soccer Yoda (that’s me) likes to think that the lessons learned through the sport of soccer contributed to the lives and successes of these men, for in the long run, for youth, that is the purpose of the game. It has been a month since the USA was eliminated from the World Cup to be held in Russia next summer. At that time the soccer community mourned the loss of a great chance to further the growth of the sport here in the United States and also the loss of the excitement of competing in the world’s biggest sporting event. There is also the feeling that every decent soccer country on the planet is going to a big party and we are going to be left out while the rest of the world is having a great time. And while nothing can be done about missing the Cup next year, as it turns out we will not be alone in our absence from Russia. In the last several weeks all qualification tournaments for the World Cup have concluded and rarely has as many consistent world powers and World Cup participants been eliminated from the championship. Perennial powers like Italy and the Netherlands will be missing. Usual participants like Chile and Ghana failed to make the cut. It will seem rather strange to long time fans of the sport to view a World Cup without these nations being represented, while Americans might take some solace in the fact that unexpected defeat is not something unique to us. Lets take a look on what happened to these teams in their failed attempts to qualify for Russia. The European qualifying tournament had 54 nations participating and were awarded 13 places in Russia. Rather than enduring many preliminary rounds, the European Football Association (UEFA) took advantage of the fact that 54 can be evenly divided by 6. They seeded their countries into 9 groups of 6 teams each. Only the winners of each group were guaranteed a spot in the Cup.. The eight best second place finishers paired off to home and away playoffs with each other and the 4 winners also made it to Russia. The fact that there are far more than 9 strong sides in Europe assured the fact that some excellent teams would be looking at playoffs and that there was a definite possibility there would be some surprise omissions from Europe. Italy – The Italians hadn’t missed a World Cup since 1958 and have won four of them altogether. Their defensive style always makes them tough to beat in a tournament and they were still blessed with Gigi Buffon in the goal. While aging gracefully at 39 yrs old, Buffon was in the nets when Italy won it all in 2006 and he is still considered one of the worlds best. What the Italians were not blessed with was a kind draw in the elimination. They were put into the same group as Spain and the Spanish are once again looking like the super team they were a few years ago. 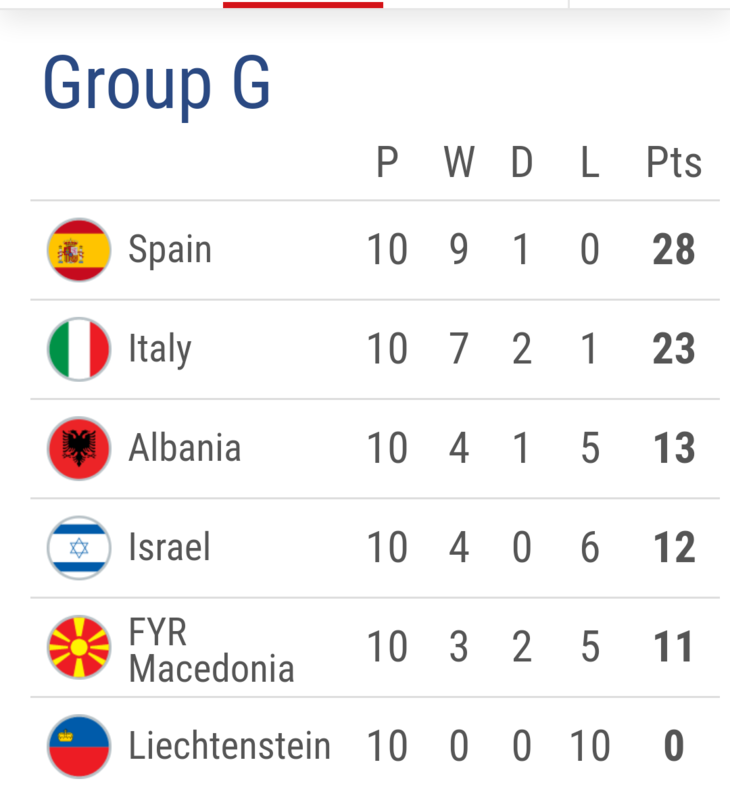 The Spanish ran away with the group and as good as Italy was, they weren’t as successful as Spain. Nevertheless the playoff was with Sweden and the Italians were confident they would qualify without having to win their group. In Sweden a deflected shot beat Buffon and the Italians lost 1-0. However, the real shock came in the return match in Milan when the Swedes played defense like they were the Italians and kept the home team from scoring. So the Italians miss out for the first time in 60 years and Gigi’s last game for his country did not reflect the successful impact he has had on Italian soccer. Gigi Buffon cries on the shoulder of a teammate after Italy was eliminated from the World Cup. Netherlands – The Dutch have been World Cup contenders since the 1970’s and have also been credited for innovating the game to its present standards. They have been a strong presence in virtually every World Cup for the last 45 years despite failing to win one. They have been considered the littlest country with the best players. But in the last few years their results have not reached the levels of past decades and their reputation as the best small country developer of talent has been bequeathed to Belgium ( or maybe Iceland). 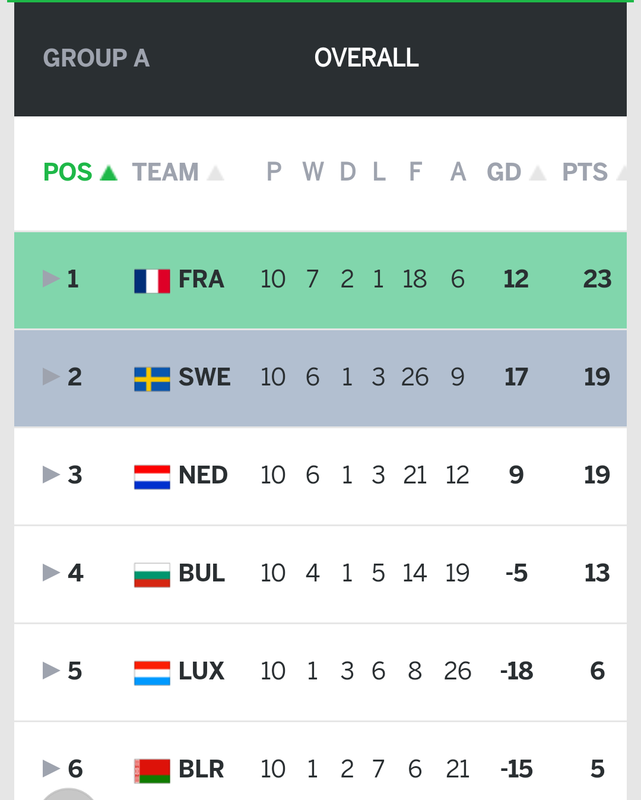 In the qualifying round they were in the same group as France, which was the favorite and a Sweden team that exceeded expectations. The Dutch had the same number of points as the Swedes but they failed to pour on the goals against the weaker teams in the same manner as Sweden did. As a result they missed out on the playoff round by goal difference. Of course, Sweden went on to knock Italy out of the Cup. Netherlands finished 8 goals behind Sweden despite having an equal record. Other European teams that that failed to qualify but have been in numerous Cups in the past include nations such as Greece, Czech Republic, Austria and Hungary. Despite 13 places from their continent, there are many sad fans in Europe. South America has far fewer nations than Europe, but the region has produced some excellent teams, particularity Brazil and Argentina, having won 7 World Cups between them. But there are other strong teams also and with only 5 possible places the competition was fierce. The qualifying round was played between 10 teams and the top 4 automatically made it while the fifth team participated in a playoff with the Oceania champion. When it was all done most of the favorites were in with one notable exception – Chile. Chile failed to qualify despite their strong play since the last World Cup. Chile – Over the last several years Chile has established itself has a team to be feared if they are healthy and motivated. They have a number of world class players and when fired up to play their best they have accomplished much. 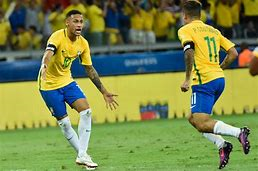 They won the Copa America tournament which decides the best team in South America in both 2015 and 2016 while last summer they finished runner up to Germany in the Confederations Cup which is considered the warm-up to the World Cup. But in the qualifying round they were neither healthy nor motivated and their results showed it. However, were it not for an appeal the Chileans filed over an illegal player they would have qualified. Chile played to a draw with Bolivia but the Bolivians used a player who did not have the needed residential time in their country. Chile appealed and were awarded a win and the 3 points that go with it instead of the one they got for the draw. But Peru had also played Bolivia when the player in question was used and they had lost. The Peruvians were also awarded 3 points instead of the zero points that a loss earns. So Peru received one more point gained by the appeal than Chile did. Chile had one point from their game with Bolivia but ended up with three while Peru had none from their match with the Bolivians but were given three also. And going into the last game Chile and Peru were vying for the last playoff spot. 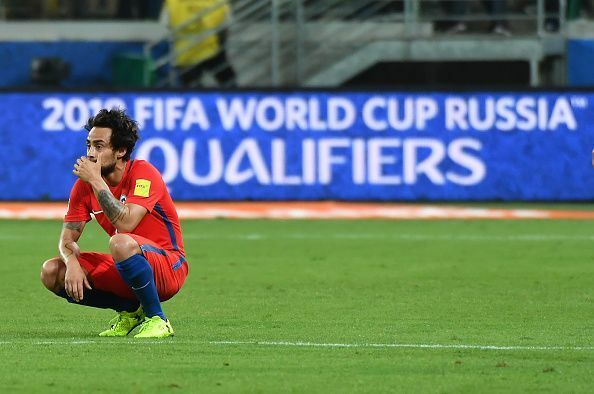 That should have been enough motivation for the Chileans but they lost 3-0 to a Brazil squad that had nothing to gain having already qualified. Those goals cost Chile the spot as they lost to Peru by 2 in goal difference. In the playoff matches Peru defeated New Zealand to make it to their first World Cup in 36 years. Peru was plus 1 goal difference while Chile was minus one. In Africa there were surprises also. World Cup regulars Cameroon and Ghana were eliminated while Senegal and Egypt qualified. Morocco and Tunisia made it while Nigeria might be ready to make a successful run in the senior cup after much success in the younger competitions. 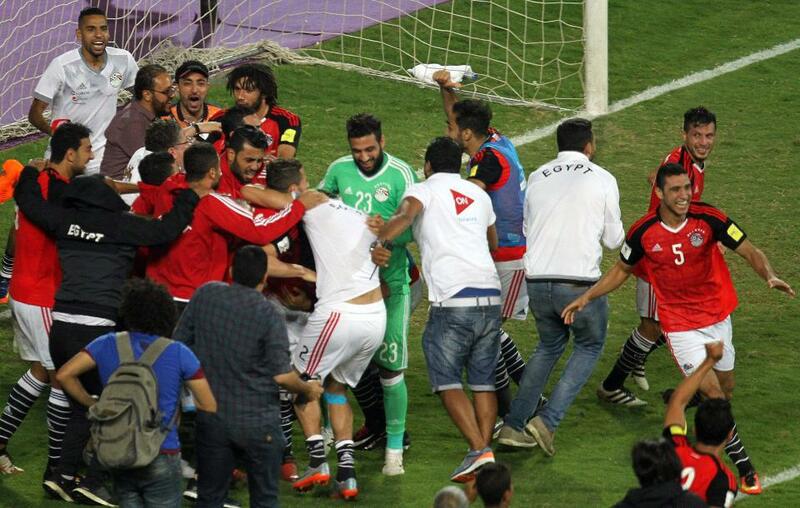 Egypt celebrates it’s last minute qualifying win. This will be their first World Cup since 1990. While all these upsets might make Americans feel better about the failure of the USA to qualify, when one examines the job required to make it to Russia in these other competitions compared to the needed finish in CONCACAF, well, it’s not so comforting. European teams needed to win a group of six or finish second and win a playoff. 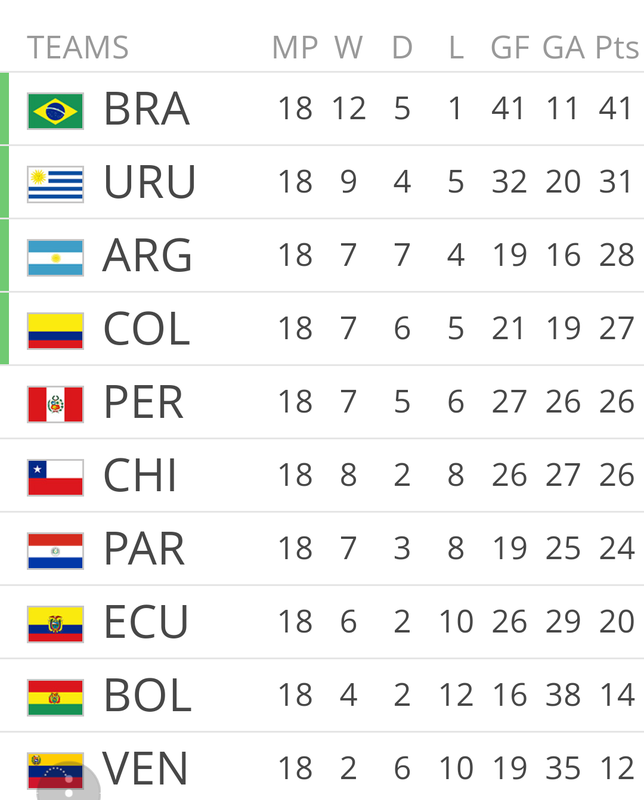 South Americans needed to finish fourth out of ten, fifth earned a playoff. But the USA only had to finish third of six or fourth to get a playoff and in a weak region at that. Yet the Americans couldn’t manage the comparatively easy task. 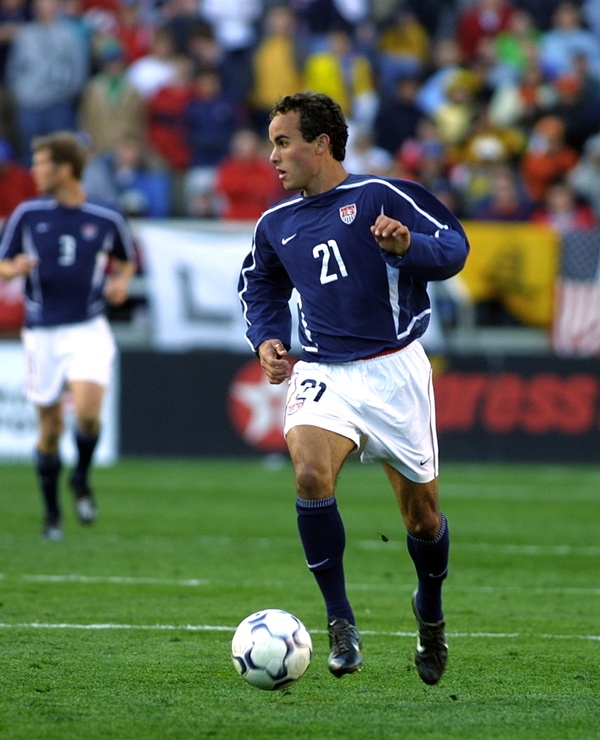 After last weeks incredulous series of events the entire USA soccer community now must join Landon in not going to Russia. It’s the first time since 1986 that the USA will not play in the world’s most watched athletic event and the lack of numbers of soccer participants in the country cannot be used as an excuse any more as it was during the mid 20th century. Actually, if one were to DOUBLE the ENTIRE population of Trinidad and Tobago and then give EVERY single citizen a soccer ball, there would still be 400,000 MORE YOUTH soccer players in the USA than ALL of the soccer players there. And we still couldn’t find 11 players who could defeat Trinidad’s 11 when it counted. Of course the fallout has been enormous, thousands have opinions as to the causes of the debacle. Among knowledgeable comments the range runs from Coach Bruce Arena’s “there’s nothing wrong with what we’re doing” to many calling for complete replacement of every person attached to the USSF . 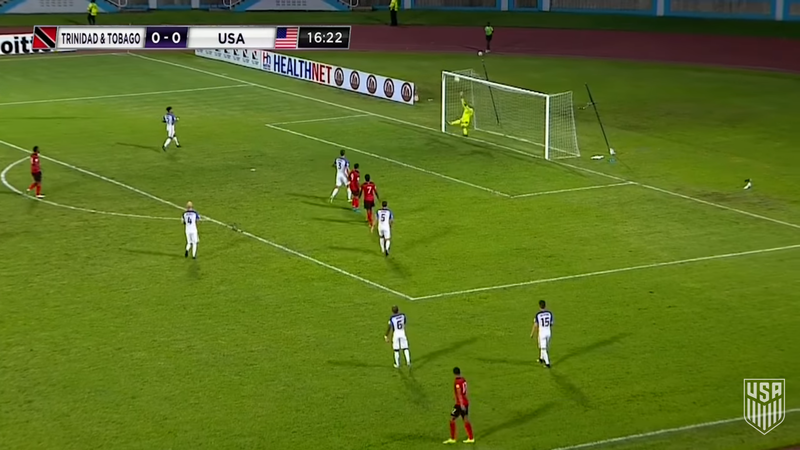 While it is true that while Omar Gonzelez’ misplay of a Trinidad cross was an error that a 10 yr old would be ashamed of, the way it managed to loop just over keeper Tim Howard’s outstretched hands and into the USA goal was rather shocking. Add Alvin Jones shot that he has never hit before and never will again AND both Honduras and Panama defeating Mexico and Costa Rica at the same time…..and the proverbial cold day in hell would be a common occurrence compared to the odds of all these events conspiring to knock the USA out of the cup. Pay to Play – In order for developing American soccer players to join large clubs and experience the game in an organized manner plus gain experienced coaching ( more about the coaching later), parents must hand over thousands of dollars to those clubs. I do not have anything against club directors for wanting to make soccer into a full-time job. I would have loved to have been able to support my family with soccer back in my employment days. But, there are a couple problems with this setup that combine to limit the development of youth players as the clubs drive to increase income. 1) What happens to the youth whose parents cannot afford to place their kids in these programs? Some clubs have scholarships but many have no form of financial assistance and others offer only token aid. This leaves tens of thousands of potential superstars without the means to develop their game. 2) In the attempt to increase the income gained from the sport, it is common for club coaches to work with two, three or even more teams at the same time. Coaching multiple teams absolutely diminishes the personal attention needed by coaches to bring each player to his/her full potential. If a club can’t find enough coaches for a “one coach – one team” philosophy, that club could reduce it’s number of players. Of course, that would decrease the total financial income and THAT would strain the full-time adults in the club. 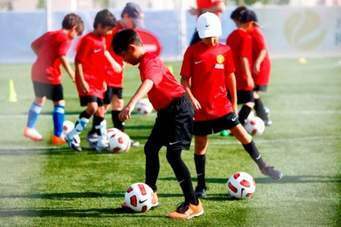 3) In order to attract more families, clubs adopt a win-at-all-cost-now philosophy since unknowing parents don’t understand that developing players to top levels takes time and the willingness to endure possibly poor win-loss records while the caliber of play gets better. Coaching Knowledge and Practices – Despite the increasing number of youth coaches who have played the game, the training practices of a major number of those coaches fails to provide their players with the means to become better players, both in their ball skills and in their tactical knowledge. Too many coaches employ practices like “agility training sessions” in which players don’t even touch a ball. Running laps does nothing to increase a player’s development…..also the amount of time spent waiting in line during practice is often is much greater than the time spent with a ball. The game is played in more than one direction – American youth soccer generally neglects to teach youngsters the value of possession, of vision, of movement to support teammates and confuse defenders. Defenders tend to lack the knowledge to cover each other and to anticipate offensive play. The American game is often an exercise in tunnel vision and as players get older it becomes more difficult to change habits formed as youth. One bit of good news is that last year the USSF changed the rules and field sizes of our youth up to age 12 to encourage tactical awareness and play. Hopefully in the coming years we will see players who have learned to be as subtle as they are now direct. The MLS – our adult players need to play…that is true. But, when capable, they need to stretch themselves and play at the highest caliber possible. Too many of our better players are in the MLS and not in Europe. Without a doubt, if Christian Pulisic had stayed in the US he wouldn’t be the player he is now and will be in the future. Our national organization needs to encourage our developing players to take advantage of any offers to play for European teams. Minor Issues – Pride in Our National Jersey…..what National Jersey? – Germany, France, Italy, Argentina, Brazil….all major international powers….all with an identifying jersey that inspires pride in the national team….both in their followers and in their players. 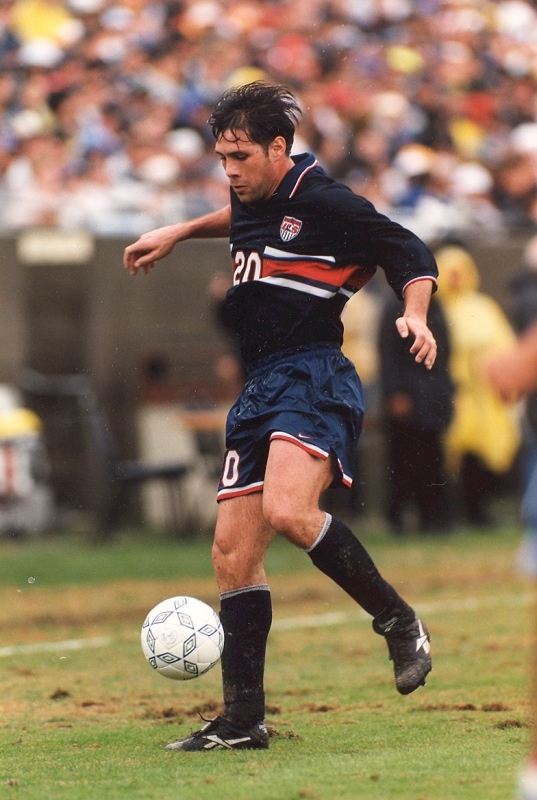 The USA seems unique too….in our constantly changing uniform for our national team. Yes, the USSF and Nike like to sell jerseys….but other nations manage to sell their wares while keeping a traditional look. Brazil is immediately identifiable by its yellow jersey and blue pants, Argentina has its sky blue stripes and of course Germany’s white and black strikes immediate recognition ( and fear?) among it’s foes. When does the USA decide adopt a look that we all recognize as our own? We aren’t English – ok, this is really nitpicking……but, it has been said that only when the USA puts it’s own stamp on the game will we truly become the respected international soccer nation that we would like to become. Anybody in this nation watching footy on the goggle box whilst eating crisps? No? Then why do we play football on the pitch in our kits and boots? Nothing against the English, but why do we think we must talk UK when referring to the sport? We play soccer on the field in our uniforms and soccer shoes. We still carry an inferiority complex about our soccer ( of course, failing to make the World Cup won’t help) but at least using our own terms in regards to SOCCER could help establish pride in our ability to play and impact the world’s game. It’s a long way to 2022, hopefully all the discussion will prompt changes, both big and small, to the game in the United States so that we never miss out on this great event again.